The Darien Town Hall is one of the buildings expected to have solar panels on its roof by next summer. DARIEN — “Here comes the sun,” the Beatles once sang and Darien seems ready to join the chorus. In an initiative to use solar energy and reduce energy consumption, the town is planning to equip three municipal buildings - town hall, the police headquarters and the public works garage - with solar panels. Sam Wahab from Davis Hill Development of Greenwich, a subsidiary of Skyview Ventures based in Port Chester, NY and one of the two companies that responded to the town’s bid, presented a potential 20-year plan to the Board of Selectmen. The one other company that responded to the bid was Encon, an energy provider based in Stratford, who will make their case on Jan. 8. Davis Hill’s plan outlines a roof mount system for the three municipal buildings. According to the proposal, the three municipal buildings are expected to produce an output of 268,180 kilowatts per hour in their first year. Davis Hill estimates the town will save $437,930 over a 20-year period if it signs a power purchase agreement with the company. “In this case, we own the equipment and sign a power purchase agreement with the town in which they buy all the electricity at a price that is lower than their current energy provider,” said Andy Karetsky, president of Skyview Ventures. According to Wahab, the total construction period would take nearly three months with utility and final inspections taking place in the last weeks. “We could have the contract signed by mid-February and be up and running by the end of June next year,” Wahab said. Davis Hill recently completed a solar panel project at Ludlowe High School in Fairfield that created a carport structure estimated to save that town $1.2 million over 20 years. 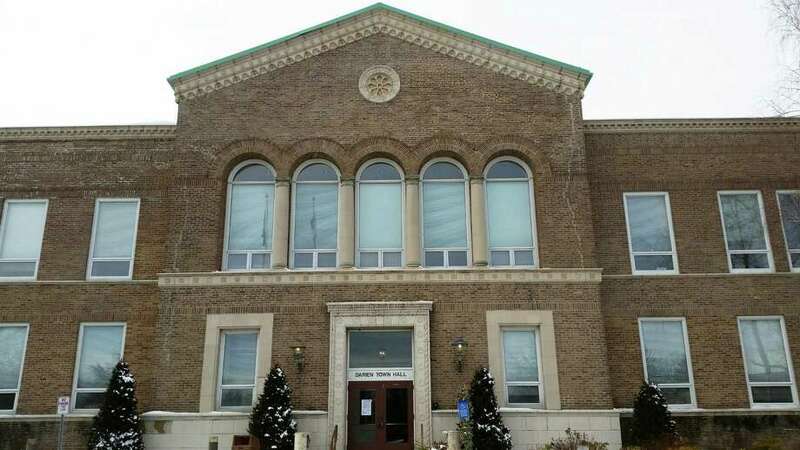 Mar Thorne, a Democrat on the Board of Selectmen, asked if adding the Board of Education building, currently on 35 Leroy Ave., into the agreement could be a possibility. “We wouldn’t say no, it would actually be helpful for us though we would have to look at some costs,” Wahab replied. Wahab added that the project would include a television monitoring system that could be used for educational purposes. “System data would be live and updated to demonstrate carbon offsets, environmental benefits and array performance data,” Wahab said. Ed Gentile, director of the public works, along with Craig Flaherty, chairman of the energy and recycling advisory committee had coordinated efforts in the town’s bid for solar energy. “We received two proposals from companies who engage in this business,” Gentile said after the meeting. “The second company, Encon, will come in and give their presentation to the board of selectmen next month. We don’t have a whole amount of time if we want to stay on schedule for next summer. I will continue to move ahead until someone says that we need to slow down or implement other steps,” Gentile added. Flaherty recalled when the town joined the Clean Energy Communities program, administered by Energize Connecticut, in October 2015. The town pledged to reduce municipal building energy consumption by 20 percent, attain 20 percent of municipal electricity needs from renewable sources and take other actions to support the deployment of clean energy by 2018. Davis Hill Development has been engaged in solar projects for seven years across Fairfield County and its solar panels rely on SolarEdge inverters and panel-mounted optimizers, according to a copy of its proposal. Encon will present its proposal to the board of selectmen on Jan. 8. “We are very excited about where this is going and we’re hopeful that we will get there,” Flaherty said.